One of the most fun things you get to buy when you have a baby is a diaper bag. I know that sounds like an underwhelming purchase, but you’ll be carrying it around for years. A well-stocked diaper bag can make all the difference in the world when you leave the house—and YES, you will leave the house at some point, I promise! Here are some of my favorite bags along with diaper bag essentials needed for each season of your little one’s growth. Ruvalino Travel Backpack and Diaper Bag. One of my requirements for any diaper bag is there must be lots and lots of pockets! Babies need a lot of things, and since a diaper bag generally replaces a purse, so will you. This gray diaper bag has tons of pockets and zippers and even comes with an insulated bottle pocket at the front to help keep your little one’s bottles warm. HaloVa Anti-Theft Backpack. This backpack-style diaper bag is a go-to when traveling. It features anti-theft straps to keep your bag securely on your back. It also has an insulated bottle pocket and a wet clothing pocket, which I hate to tell you will come in handy more often than you would think! SoHo Grand Central Station Diaper Bag Set. This set is filled with diaper bag essentials that all match each other! You’ll get the (super cute!) diaper bag, a padded changing pad, two coordinating accessory cases, an insulated bottle bag, a small ‘grab and go’ personal purse as well as several other accessories. Parker Baby Diaper Backpack. This diaper backpack is gorgeous! I love the cream and gray color combination. It’s functional too—it’s waterproof and features an insulated bottle pocket along with a changing pad. Floral Baby Bag. If you are looking for an ultra-feminine diaper bag…this is the one! This black bag is covered in a gorgeous peony floral print. It comes with a changing pad cover and a separate insulated bottle bag that you can grab and toss into any bag you need, which I really like! HaloVa Waterproof Backpack. If you like to have the same bag in a lot of colors, this diaper bag collection is for you! It comes in 16 colors, which includes a few really fun prints as well as many neutrals. This diaper bag is waterproof and has a tissue dispenser pocket which can definitely come in handy during cold season! Isoki Madame Polly Diaper Tote. Rather have a diaper bag that looks like a chic purse? This sleek black diaper tote is perfect! It looks like a large, trendy purse—and it’s large size fits all the diaper bag essentials you could ever need! Kah&Khee Laptop Diaper Bag. Working mamas will appreciate having a diaper bag that can hold her laptop too! This neutral brown backpack includes a separate padded laptop section that will keep your tech safe. Ah, the newborn years. Your little one is oh-so portable at this stage! It may not seem like it, but this is one of the easiest times to get out of the house as your baby will be sleeping off and on most of the day. However, newborns require a surprising amount of stuff for such a tiny person! Here are the diaper bag essentials for newborns you’ll want to keep handy. Diapers. The type of diapers you choose to use for your newborn is a big decision, but whatever you choose, you’ll want to make sure your diaper bag is stocked with plenty of them! I personally like Pampers Pure since they are great for baby’s sensitive skin. Wipes. Like diapers, once you decide on a wipe brand and type, you will want to make sure your diaper bag is stocked with plenty of them! I used Water Wipes for my newborn’s ultra-sensitive skin. Portable changing pad. Despite your best efforts, you’ll be doing plenty of diaper changes in public. Please, please, please put something under your baby when changing him or her! Hand sanitizer. For all those diaper changes, body fluids and other fun stuff! Keep your bag stocked! Burp cloth. Newborns spit up a ton—you’ll want several of these on hand for every feeding. Trust me! Nursing cover. If you are nursing you may want a cover-up. If you are nursing and do not want a cover-up—I support that 100% too! I like these covers because you can also use them to cover your baby in the car seat safely away from all the germs! Bottles and formula. Alternatively, babies who are formula-fed will need plenty of formula on hand and bottles. Many diaper bags come with an insulated bottle pouch, but if not, grab one to keep your little one’s milk warm. Biodegradable bags. You’ll reach for these again and again. Wet, gross clothes? Toss them in a bag. Dirty diaper? Into the bag as well! Bodysuits. At some point, you’ll definitely have a blowout. Sorry, it’s just a fact of life. And likely, it’ll be in an incredibly inconvenient place….i.e. in public! Keep your bag stocked with spare bodysuits so you aren’t caught without. Blanket. Blankets are one of the handiest things a mom can have. You can use it for so many things—a makeshift nursing cover, a fashionable scarf to cover spit up, a place to lay your baby down on, or—of course—a blanket to swaddle baby in! At this point, you’ll be able to drop many of the newborn items, but your infant will still require plenty of items inside the diaper bag. Of course, you’ll still need diapers and wipes, but there are a few changes. Here are the diaper bag essentials I recommend you stock up on for a 6 to 12-month-old baby. Bibs. By this point, your little one is starting to eat solids. Guess what? They are very messy eaters! I am a big fan of wipeable bibs—definitely diaper bag essentials! Teething crackers. When I was out at the grocery store with my daughter one day, someone stopped me to tell me about teething crackers. SO glad they did! They are a game-changer. Puree pouches. Toss a few of these in your bag to keep baby happy when he or she needs a quick meal on the go. Pacifier. If you choose to use a pacifier, make sure you keep a backup or two in your diaper bag! You don’t want to be out without one. Hat. If you plan on keeping baby out in the sun for any amount of time, keep him or her protected with a hat that has SPF. Diaper rash cream. Diaper rashes do occur sadly, and this cream will help baby feel more comfortable. Nail clippers. Baby fingernails are razor sharp—make sure you have clippers on hand to keep everyone safe! Toy. Your baby is starting to play quite a bit—make sure you have something on hand to keep him entertained while you are out. Board book. It is literally never too early to make your baby a book lover! Plus, it’s just one more thing he or she can gum on to feel more comfortable. Teether. Your little one may be starting to gum at things, which is a sure sign she is teething. Make sure to have a few teethers on hand so you aren’t being chomped on by your little one constantly. Your one-year-old is likely walking or right on the verge of it. However, that definitely does not mean you want to stop carrying a diaper bag! In fact, items like extra changes of clothes and snacks may be more important now than ever! Here are the diaper bag essentials you will want to keep handy for your one-year-old. Placemats. Yes, you’ll be eating out in public. And yes, your little one is just as messy here as they are at home! Do everyone a favor and use these placemats to keep meals as clean as possible. Disposable changing pads. At this point, your little one has likely outgrown those nice little changing pads…sniff. Keep everything sanitary on public changing tables by using these. Sippy cup. The transition away from a bottle has begun (sniff sniff). Make water or milk more portable by grabbing these cups. Snack container. You can fill these with whatever you like, but puffs or plain cheerios are a winner in our home! Toddlers are a lot of fun—they have plenty of personality and love to stay active! While it may seem overwhelming to wrestle a toddler into the car seat, you will be doing so many, many times. Make sure you grab your diaper bag too…and keep them stocked with these diaper bag essentials for toddlers. Utensils. Help baby eat in public by using these safe utensils, rather than the adult version restaurants keep stocked. Baby bowl. Learning how to eat out of a bowl is messy but necessary…even when you leave the house! Baby shoes. Your little one will be running all over the place by now! Shoes can get messy quickly, so keep a backup pair handy. Interactive toy. I like to keep a special toy in the diaper bag that’s really fun. It only comes out when I really, really need it to. 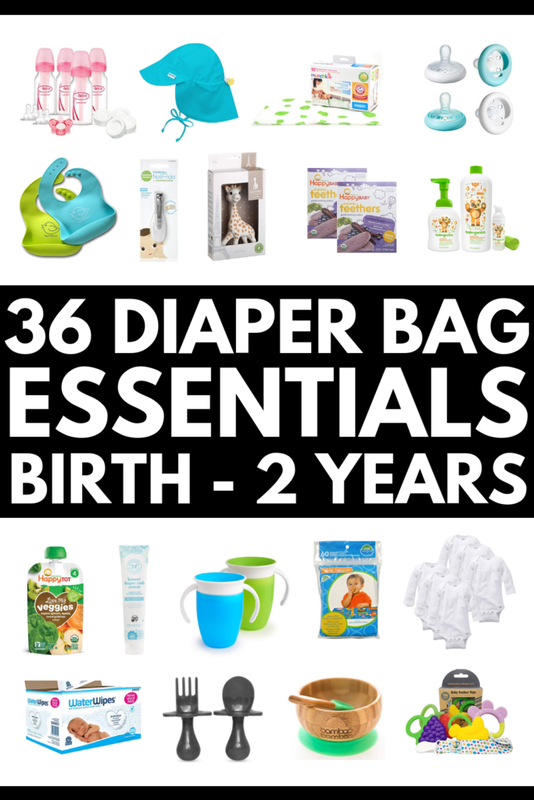 I hope you found this collection of diaper bags and diaper bag essentials helpful! If you found this collection of diaper bag essentials useful, please share this post on Pinterest! And if you’re looking for more baby tips and ideas, please follow our Life with New Baby board where we share all kinds of helpful information we find each day! Tania is a freelance writer and blogger. As a type 7 enneagram, she is known as the life of the party, but on her nights off, she can be found with a good book and a glass of champagne, spending time with her one-year-old daughter and husband at a local park, or working on her DIY blog, Run to Radiance.